Riverdale is a show built around protracted flirtations, none more thrilling than that between its kookoo-bananas invented world and our flesh-and-blood reality. For a vast swath of fans (including, admittedly, myself), the program does not take place between 8 and 9 P.M. on Wednesday nights but all day every day, insofar as the lives of its actors have been woven into the fabric of the fiction. Watching actual couple Lili Reinhart and Cole Sprouse canoodle on their Instagram accounts feels like an extension of each episode, or maybe it’s that each episode has been informed by their offstage chemistry. Either way, there was a palpable Jughead-and-Betty-ness to the daring photo Sprouse posted to celebrate Reinhart’s birthday, a “little muse” happy to command the attentions of her brooding, artsy boyfriend. Many thousands of words could be written about whether this makes the show more enjoyable, and why it absolutely does, and what that fact says about the deformed, mushy brains of habitual TV viewers, but there are more pressing matters to attend to. 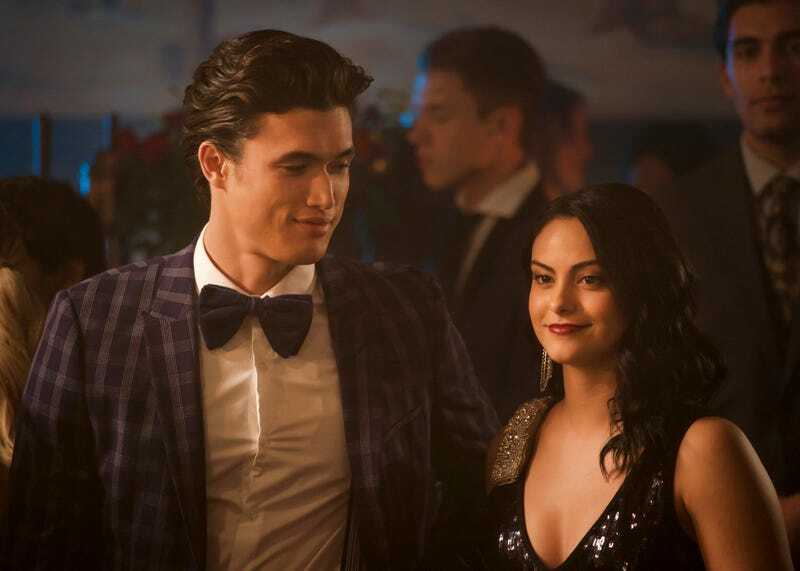 The same faction of viewers closely tracking the evolution of the [deep breath] “Sprousehart” relationship will also undoubtedly be aware of the blossoming romance between stars Camila Mendes and Charles Melton, who announced their status as an item on October 7 of last year — three short days before the third season premiered. As the series has less-than-subtly steered Veronica away from Archie and into the toned arms of Reggie, I have spent the past few months consumed by obsessive chicken-or-the-egg madness. Did the writers get a sense that something was percolating between their players and follow the scent of hormones? Or could sharing these intimate scenes have possibly drawn them together? Would the former case make the show more ‘real,’ or the latter case make their relationship ‘fake?’ I won’t dignify the species of conspiracy-monger theorizing that such couplings get cooked up by networks to goose ratings — that’s for career YouTubers — but the interplay between the actors’ personae and their characters has been fascinating to observe. Perhaps there are healthier hobbies for a person to have, but it’s 2019 and we’re all just trying to make it through the week. Some of my friends have taken to smoking cigarettes; I started doing this. All of which is to say we’ve finally gotten to the point of this season’s often-lugubrious Veronica plotline, the opening of La Bonne Nuit. The constant harassment from her father and his gargoyle goons has provided a convenient way to build the tension threatening to split the Lodge family in half, and the idea of a Jazz Age-styled speakeasy hideaway for teens in a small Pacific Northwest town is just insane enough for me to accept, but the real purpose of this rigamarole is at last made clear in the final minutes of the episode. It’s the culmination of an inevitability, like the space between two pairs of lips gradually disappearing as they lean in for a kiss. Archie, meanwhile, remains very single. He’s as single as he can possibly be, hidden out in a fortress of solitude that we’re told is located in the “Canadian hinterlands” despite having been ripped directly out of an L.L. Bean catalogue. He’s a forest ranger, it appears, but he must not be very good at it, because he lands himself in loudly foreshadowed mortal peril after approximately ten minutes in the woods. His ensuing comatose hallucinations make great strides towards a return to non-awfulness for Archie, so mired in being a big dumb beautiful idiot as of late. Isolating him from the rest of the cast initially struck me as a panic move, but it’s cleared the space for some much-needed character rehabilitation. As Archie himself points out, he hasn’t picked up a guitar in forever. He changes in phases, and his self-contained odyssey of the mind may very well introduce a new one. Only through grisly, literal self-destruction can he rebuild. Jughead’s doing some rebuilding of his own, having gained entry back into Riverdale after getting stopped by the police blockade at the end of last episode. Now that he’s back, he needs to regain the trust of his fellow Serpents, who have grown weary of lean times and begun looking into illicit sources of cash flow. Cheryl Blossom and Toni Topaz, for instance, now spend their leisure time pulling off heists dressed in feline-themed kink gear that puts the “cat” in “cat burglar.” Their function as paper dolls for the writers to dress up in outfits of their choosing might be troublesome, if the outfits the writers chose weren’t so nakedly indulgent. Every Cheryl Blossom/Toni Topaz plotline is, in no small respect, fan-fiction of itself. We know this because this is where the line “Has anyone ever told you you’re a badass?” turns up. Jughead wants them back on the straight-and-narrow, and while living a crime-free and fully sober lifestyle seems to me to defeat the purpose of being in a gang, that’s the plan. He finds them gainful employ as the hired muscle of Veronica Lodge, which solves their money problem, and that’s that. Rare to see an issue arise and resolve within the course of a single episode, this season having been heretofore oriented around long-game storytelling. Make me miss the simpler days, of mischief in the halls of a high school that hadn’t been put under martial law by “crypto-fascists” who won’t let girls hold hands. Didn’t they put on a school play, like, last year? At least Betty and Jughead have been reunited, and she’s taken back her spot at his right hand as Serpent Queen. Still, her one-woman crusade to get some justice out of this whole quagmire with the Sisters of Mercy and their odds-on backer Hiram Lodge has only served to put her on a lonely narrative island. The Nancy Drew escapades with her trusty legal counsel keep bringing up the same blue-mouthed dead end, and allow her nobody to bounce off of. Betty’s been shown to be an unpredictable quantity on the show, but saddling her with the responsibility of looking after a bunch of brainwashed kids and forming a court case against sinister nuns and deposing Hiram has robbed her of that quality. It’s cumbersome, and this quest-based structuring has gotten in the way of the relationship material on which the show made its name. The show’s need to continually top itself in terms of stakes has estranged it from these roots. When things start to heat up between Veronica and Reggie, the show starts feeling like itself again, dedicated to the head-rush feeling of being an infatuated teen. This mishegoss with the Gargoyle King and the Fizzle Rocks and the Sisters of Quiet Mercy has taken us down some divertingly bizarre tangents, but the main path to be returned to will always be couple-stuff. The sooner Archie’s back in town and school’s properly back in session, the better. Riverdale is an elastic town, always snapping back into place no matter how cataclysmic their year, but perhaps there’s no going back to the show’s normal, horny, happy-go-lucky self. Like Buffy and Harry Potter before them, will the kids of Riverdale have to leave its plucky-teen self in the past as it forges ahead into darkness? - Where do they get the chutzpah, using Creedence Clearwater Revival’s “Lookin’ Out My Back Door,” a song that all but has The Big Lebowski’s name branded on its hindquarters? - Count me as a huge fan of Hiram’s ostentatious mink coat. Strong “just pulled off the Lufthansa heist, about to get yelled at by Jimmy the Gent for your rash spending” energy. - I recognize that The CW has budgetary limits, but if you’re going to have a character get attacked by a bear, we’re gonna want to see that goddamn bear. Why even bring up a bear in the first place if you’re going to hold out on us for the sweet, sweet bear action? - Assuming this show eventually resumes its standard of normalcy and turns back into a high school soap instead of going crisis-mode permanently, may the love triangle between prodigal son Archie, new beau Reggie, and coveted Veronica be fiery and no-holds-barred. - Say what you will about Riverdale, but it’s the only show on television to soundtrack a mass nun suicide with a mournful rendition of Cabaret showstopper “Maybe This Time.” Where are your nun overdoses set to misapplied Broadway standards, Game of Thrones?